If there’s one thing that a sailor needs, it’s concentration. If the wind shifts even a little — so do the sails, a turn overshot — down go the rudders momentarily. If momentum changes, then so does the sailor’s body as they attempt to cancel out the weight change by ducking under the flailing sail and flinging their torso over the other side of the boat — all standard practice on a good day of sailing. December 15th, 2017 was not always going to be a good day for Amanda Anastassov, a young sailor from La Chat, and her partner, Max Wallenberg. It marked their final race in the Youth World Sailing Championships in China. Starting the day ranked three points from first and four ahead of third, the duo knew that their thirteenth race would be no easier than the twelve onerous ones that preceded it. Amanda, currently nominated for the 2017 Most Promising Swiss Sports Persons’ Prize, knew that a middle-of-the-pack placement in this race might have been enough to secure a second overall finish — but the odds seemed against them. An unbridled wind — particularly uncharacteristic for the Hainan Island — offset the jib (front sail) just moments into the race, threatening to derail any chances to finish in the first half. For Amanda, whose job involves fixing the sails and bringing up the speed, the pressure was on. The tactical game plan had been altered and the margin for error slimmed even more. But this was a problem she’d dealt with a hundred times before. Manoeuvring herself under the unfixed and erratically-moving sail and towards the bow, she adjusted the jib before returning to her previous position, helping them finish fifth in the race, and first overall in the Youth Championships. Sailing has always been a part of Amanda’s life. Having been on boats since the age of two, and taking up sailing five years later, the sport has become a paramount activity for her. She discovered her love for sailing at a summer camp and has since been enthralled by the culture and experiences that come with it. Supported by her family, most of whom also possess a love for the sport, she has been able to thrive in her field. This success has come at a personal cost: at the beginning of the 2018 academic year, Amanda made the decision to stop going to school, instead electing to focus on her archetypal sailing regimen and to be homeschooled. Being away from friends and spending hours in the gym has disrupted patterns of her day-to-day life, as Amanda has had to sacrifice both family and free time to pursue her passion. 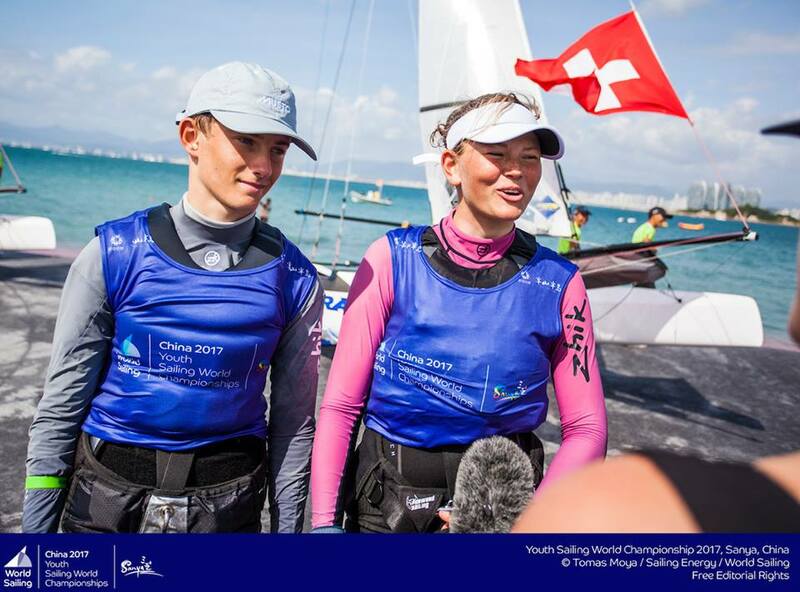 However, it has also reaped its benefits, as she and her sailing partner have been nominated for the “Most Promising Swiss Sports Persons’ Prize of 2017”. The nomination is a reflection of their unique achievements which has not only kickstarted their international success, but also that of Switzerland’s, which has gained two eligible competitors for the Youth Olympics. However, it has also reaped its benefits, as she and her sailing partner have been nominated for the “Most Promising Swiss Sports Persons’ Prize of 2017”. With the wind in her sails and the homestretch completed, La Châtaigneraie’s very own Amanda Anastassov can win the prize with your help. The voting system for the Prize constitutes of media (40% percent of the vote), a jury (40% of the vote), and the public (20% percent of the vote). As members of the public, by voting for Amanda Anastassov and Max Wallenberg, you can help them win this prize. For voting information, please look below. Posted in Sports, Student Life, Uncategorized, World and tagged competition, sailing, sports, youtholympics. Bookmark the permalink.